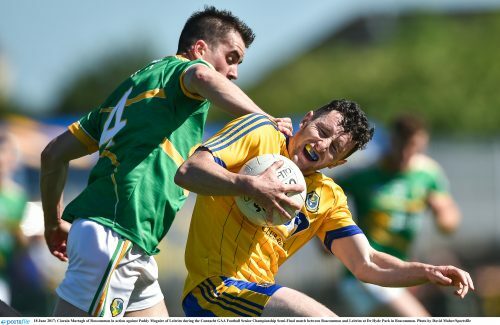 Events at Dr Hyde Park will only have rubbed salt into London wounds, as the Exiles will feel they could have given Roscommon a far better run for their money than Leitrim managed. Leitrim were comprehensively put to the sword 2-23 to 1-9, having edged out London at McGovern Park last month, as they proved no match for the Rossies. Last year’s Connacht runners up showed few ill effects from their 11 week sabbatical, putting in a masterful display of attacking football wing with back Conor Devaney netting both of Roscommon’s goals in the first half – such was the Rossies attacking dominance. Roscommon were in control from the start, opening up a four-point advantage after just five minutes, and they never let up. Leitrim simply couldn’t deal with their opponent’s high pressure game plan. Brendan Guckian’s side did, however, stun Roscommon with a sixth minute goal as a swift attacking move saw the ball passed through Ryan O’Rourke and Conor Gaffney into the hands of Darragh Rooney, and he picked out the bottom corner with a powerful drive to add to the goal he scored against the Exiles. Normal service was soon resumed, however. Fintan Cregg and Niall Kilroy pointed, before Enda Smith drew a fine save from Brendan Flynn, only for the rebound to fall perfectly for Devaney to blast the ball into an empty net. Devaney added another goal from close range and Roscommon led 2-9 to 1-2 at the interval. 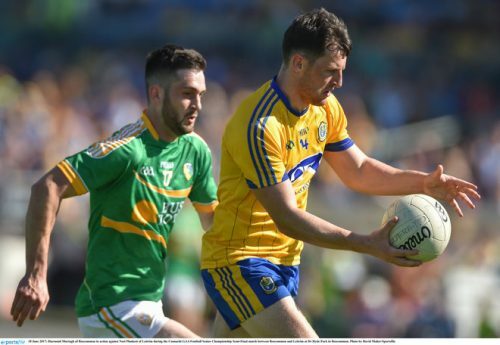 It was more of the same in the second half with Leitrim’s forwards reduced to living off scraps, while at the other end Roscommon continued to pick off points with ease. “It never feels like that when you’re managing on the sidelines – you can never be far enough ahead. 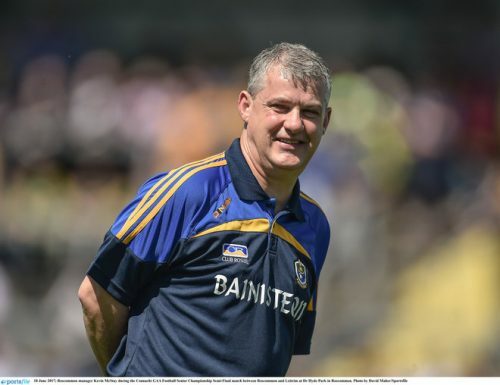 That sounds a bit glib but it’s not,” said Roscommon manager Kevin McStay. “You’re always looking at where you can improve, if you’re five up or ten up. We got a run on them and that’s what we planned to do. We did want to hit them as hard as we could early on on the scoreboard. Whether this was good preparation for a Connacht final with defending champions Galway remains to be seen, as the Rossies look for revenge for last year’s final defeat to the Tribesmen. Scorers for Roscommon: D Murtagh 0-7 (1f), C Devaney 2-1, Ciaran Murtagh 0-4 (3fs, 0-1 pen), E Smith 0-3, F Cregg and B Stack 0-2 each, D Smith, N Kilroy, C Connolly and S Killoran 0-1 each. Scorers for Leitrim: D Rooney 1-2, K Beirne 0-3 (1f), R Kennedy 0-2, D Moran and B Gallagher 0-1 each. Subs: C Connolly for Smith (14 – bc), C Compton for Connolly (45), R Stack for Kilroy (45), S Killoran for Patterson (48), B Murtagh for B Stack (60), T Featherston for C Murtagh (65). LEITRIM: B Flynn; N Plunkett, D Wrynn, P Maguire; J Rooney, M McWeeney, O Madden; S Moran, D Moran; D McGovern, C Gaffney, R O’Rourke; K Beirne, B Gallagher, D Rooney. Subs: N McGovern for D Moran (35+3 – bc), R Kennedy for D McGovern (35+6), G Reynolds for McWeeney (45 – bc), C Cullen for O’Rourke (47), R Gallagher for Wrynn (58), G Plunkett for Gallagher (67).